Casa Forno, a Portuguese name, describing a traveller's home away from home, becomes the doorstep to Namibia's Northern tourist destinations. Casa Forno Country Hotel is a beautiful, upmarket bed and breakfast situated in Otjiwarongo, Namibia and just 5 minutes walk from the CBD. Its furnishings are modern with a Cape Dutch influence and it offers a stylish, relaxing atmosphere and welcoming Namibian hospitality. The accommodation is part of Casa Forno Country Hotel which also includes an atmospheric a la Carte family restaurant, fully-licenced pub and cocktail bar and a conference venue. Free wifi is available throughout. 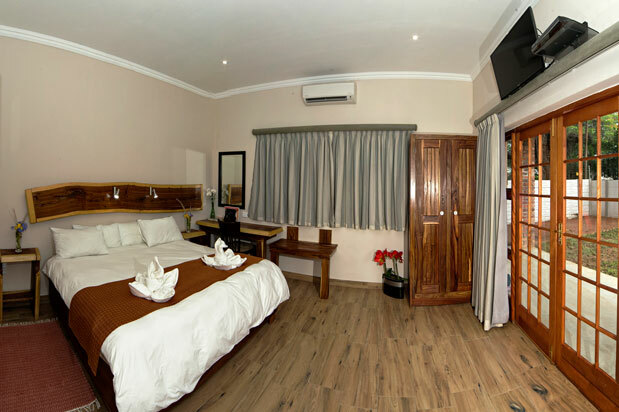 Our en-suite hotel rooms are equipped with hot and cold air-conditioning, DSTV television, coffee making facilities and a fridge. Ample secure parking is available. *Price quoted is per room and not per person. Children between 5 and 12 years sharing with two adults pay 50% of rate per child. A child that is 4 years old and younger, and is sharing with two adults, stays for free.